Chemical vapor deposition (CVD) diamond micro-components are attracting considerable interest due to their exceptional properties and potential applications. Micro-gears are an important actuating component in micro-machines or micro-electromechanical systems. In this study, nano-crystalline diamond duplex micro-gears for micro-machine applications have been fabricated by combining hot filament CVD (HFCVD) with inductively coupled plasma etching. 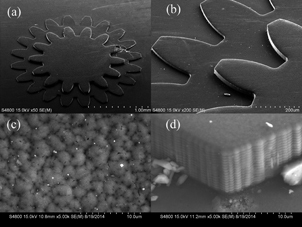 Based on scanning electron microscopy, X-ray diffraction, and micro-Raman spectroscopy observations, the nano-crystalline diamond duplex micro-gears produced by HFCVD are found to be faithful replicas of microstructure silicon molds produced by time-multiplexed deep etching. The fabricated duplex micro-gear consists of two gears. A gear with 14 teeth constitutes the top layer and has root and tip diameters of 1.14 mm and 1.52 mm, respectively, while the second 20-tooth gear constitutes the bottom layer and has root and tip diameters of 1.75 mm and 2.20 mm, respectively. The total thickness of the micro-gear is about 20 μm.